The 1950s were heady days in the automotive world. The post-WWII era brought sweeping advancement in technology, design, and horsepower. Money was flowing, and things were quite prosperous in the United States. A corresponding increase in car sales and a demand for large and luxurious cars led to ballooning prices. By the end of the decade, a full one in six Americans were employed directly or indirectly by the industry. Most of the smaller auto manufacturers had folded, or been absorbed into a larger company. For the most part, the American auto industry consisted of The Big Three, plus Studebaker and AMC. Occasionally, however, a unique manufacturer would rise from nothing to bring something new to the table. Dual Motors was the brain-child of Eugene Casaroll, who wanted to build a truly exclusive car at a reasonable price; Coachbuilt bodywork at Cadillac prices. Casaroll started with a Dodge D-500 chassis and 315ci Hemi V8, which he shipped over to Italy for Carrozzeria Ghia Torino to shorten the wheelbase and fit it with gorgeous bodywork inspired by the works of Virgil Exner. The large cars were only available in one body style, a four-place convertible, as shown here. From 1956 to 1958, only 117 Dual-Ghia luxury convertibles were built. 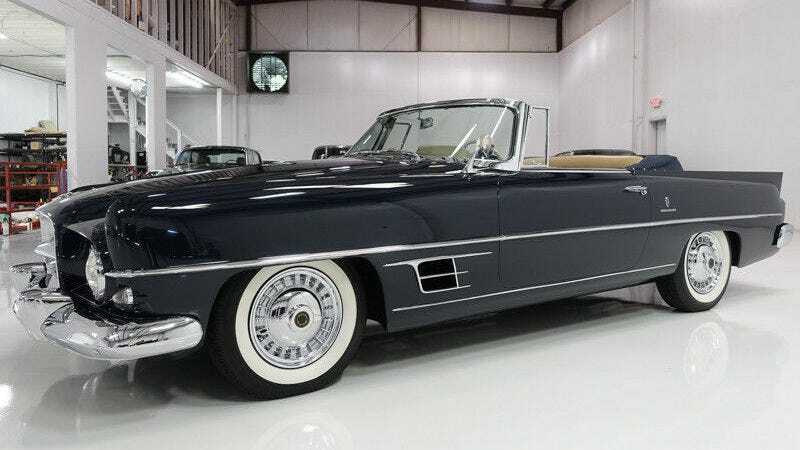 With a price tag of $7500 (about $63,000 in 2017 money), a Dual-Ghia was the most expensive American car at the time-$200 more than a Cadillac Eldorado Biarritz drop-top. Because of that, they were often the choice of the Hollywood elite, or music stars like Sinatra and Dean Martin. Allegedly, Ronald Reagan owned one briefly, before losing it in a poker game to then-president Lyndon Johnson. This particular car is said to be one of about 50 Dual-Ghias sold with Dodge’s more potent tune engine, which made use of a four-barrel carb and larger valves to deliver 260 horsepower versus the standard ‘Red Ram’ Hemi’s 230. As with all Dual-Ghia, the power is routed through a two-speed TorqueFlite automatic. Of the original 117 cars built, only about 1/3rd of the production run are known to exist today. This car is said to be the nicest Dual-Ghia in existence, having won its class at the Pebble Beach Concours D’elegance in 2010. It’s certainly a collector-grade kind of car, based on the photographs and provenance, but the half-million dollar price tag is certainly quite dear. If you feel you simply must have it, you can find it on eBay here.